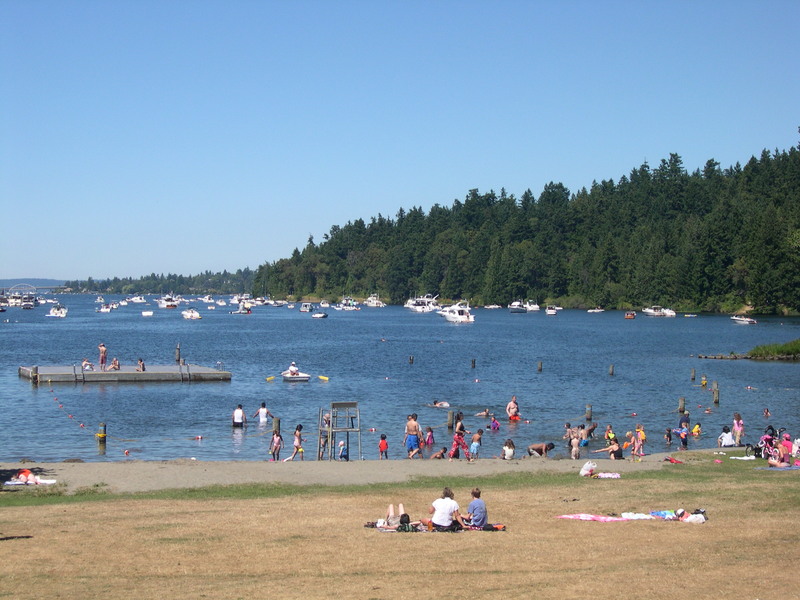 Seattle’s second largest park sits on a mile-long stretch of lake Washington’s shoreline and features sports fields, a swimming beach, public sailboating, an off-leash dog park and "Kite Hill," a huge man-made hill constructed from earth and pavement pieces of the old airfield tarmac. Paved paths throughout the park are wide and uncongested, making for an easy ride. A good place to start is near the swimming beach, or by the playground. Pair with: Epic kite-flying on Kite Hill or a barbecue picnic at any of the designated picnic areas. For kiddos interested in history, check out the Fin Project — actual diving-plane fins from decommissioned Navy subs arranged to look like orca dorsal fins. Last but not least, don’t miss the “air, land and sea” themed playground, with colorful climbing walls, a sand box, swings and slides. It’s the Big Kahuna of Seattle biking. 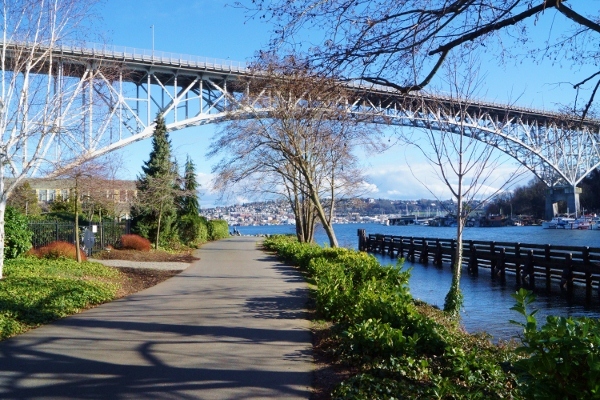 From Ballard to Bothell, this 27-mile trail winds through parks and wineries; along city streets and beaches. The path can be congested with experienced cyclists, but there are a few spots that still offer fun for the wee bikers. We stopped in Fremont to check out the section of path that runs parallel to the Fremont Cut. Unlike much of the trail, this part was uncrowded. My son loved riding along the water and looking up at the Fremont and Aurora bridges. The huge dinosaur-shaped bushes were a hit, too! After biking: Stroll through Fremont, or (better yet) take a tour of the Theo Chocolate Factory! Follow with a short drive to Tutta Bella for some kid-friendly pizza. Prime waterfront property, running from Alki Point to Duwamish Head on Elliott Bay, Alki Beach features stellar views and excellent people-watching. 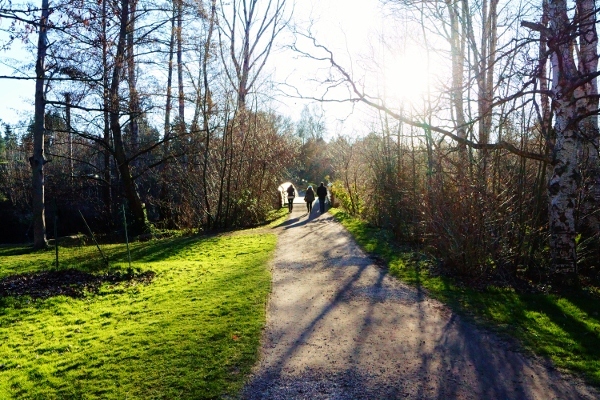 Sunshine brings out the crowds, but even on the coldest days you’ll find people strolling the 2.5-mile path. My son and I like to start at the Statue of Liberty and see how far down the strip we can make it before the desire to play in the sand overcomes the need for speed. After biking: Visit the Alki Point Lighthouse, built in 1913. 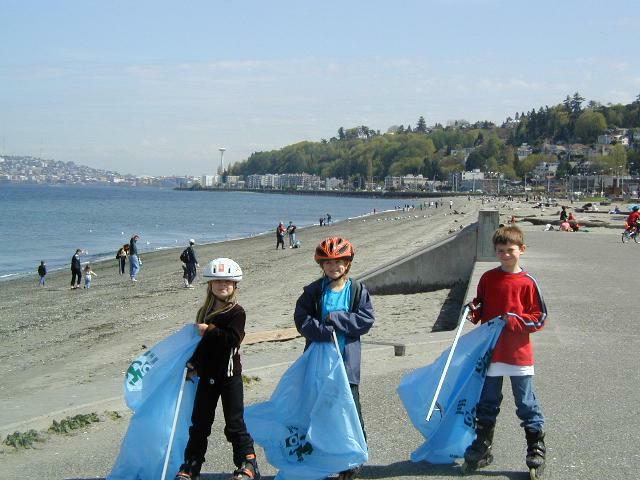 Or squeeze in more play time at Alki Playground. 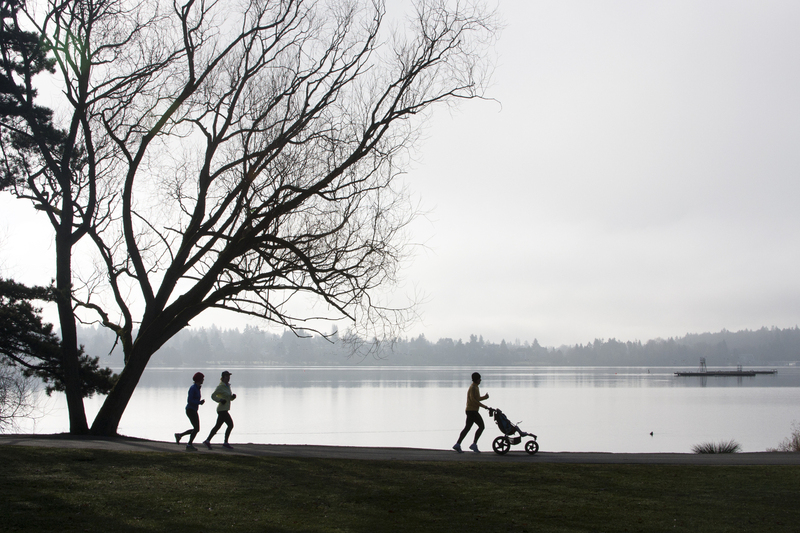 For decades, Green Lake has been one of the top go-to spots for parents with kids in tow. Families have spent many a season there strolling, biking, picnicking and paddling. Come summertime, you can bet the 2.8-mile loop around the lake will be packed with cyclists, skaters, joggers and strollers, but alas, we couldn’t leave it off the list. It may not be the best place for beginning bikers, but it’s Green Lake, and we love it. After biking: Stop by Mockingbird Books for a kid-friendly browse. And be sure to check out Green Lake’s top-notch playground. Running parallel to the longer Elliott Bay Trail on Puget Sound in downtown Seattle, the Myrtle Edwards Park Trail starts at the Olympic Sculpture Park and stretches along the water, boasting postcard views. The paved path is great for kids to bike along, and the tiny rose garden and pint-sized beach make for perfect pit stops. My son especially loved getting up-close and personal with the massive barges towards the north end of the trail, and was super excited to watch a train pass by. 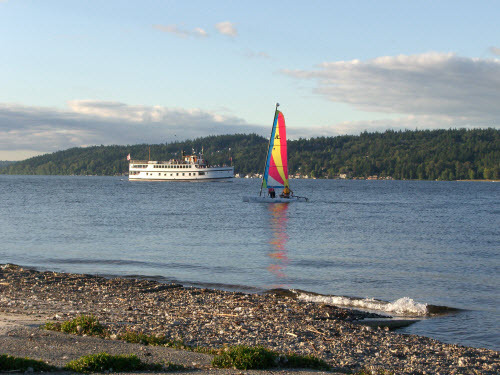 After biking: Indulge in more waterfront fun! Lunch at Ivar’s, find treasures at Ye Olde Curiosity Shop, take a spin on the Seattle Great Wheel or visit the Seattle Aquarium and wander the Olympic Sculpture Park. Talk about prime photo opportunities! Note: Closures of this park occur during Seafair Weekend, Aug. 5–7, 2016. Check hours online. No stranger to cyclists, Seward Park is one of Seattle’s loveliest places to travel on two wheels. For younger riders, the 2.4-mile trail that loops around the peninsula is the way to go, with a wide, paved path that, even on crowded days, feels much less congested than Green Lake or Alki Beach. Make some pit stops to play on the beach or have some fun at the little playground. Oh, and did we mention the views? After biking: Visit Seward Park, home to the Environmental and Audubon Center, and which offers some awesome nature classes. You will find trees, trees, trees — plus 200 acres of gardens, wetlands and woodlands all along the shores of Lake Washington; the Arboretum is truly a place of unsurpassed beauty. The park is well-known for its superb nature viewing, hiking, canoeing and picnicking, but it’s also a wonderful place to take your tots to test their wheels. We took the Arboretum Waterfront Trail, stopping to watch ducks and climb a tree. After a while, my son ditched his scooter and we decided to walk through the park, enjoying the beautiful late afternoon; crisp and sunny with the light filtering through the trees and reflecting off the lake. Another fun path is to head down Arboretum Drive from the Vistor Center, which is closed to traffic. After biking: Visit the Japanese Garden (a short drive away): Kids will love the opportunity to run through the garden paths, searching for turtles and koi in the ponds. 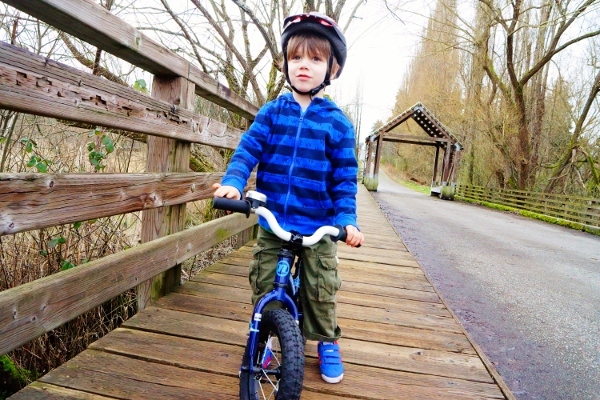 Tucked among the wetlands, Juanita Bay Park and Juanita Beach have become prime bike riding venues for Eastside tots. After a huge renovation, the beach reopened several summers ago and has since then been attracting families, many with wheels in tow. Kids take full advantage of the smooth, uncrowded path that runs along the beach, many of them eventually ditching their scooters for shovels and hitting the sand. 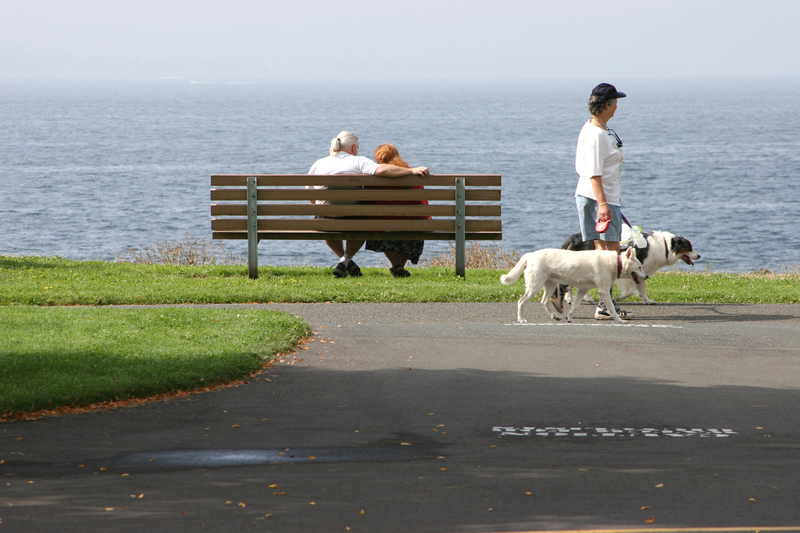 Venture a little further to the boardwalk; a wide, beautiful path that that runs along the shores of Juanita Bay and connects to Juanita Bay Park. Here, kiddos will find more biking paths as well as a couple of smaller boardwalks that jut out into the bay. On any given day, one will be able to spot ducklings, turtles, eagles and more. After biking: Indulge in fish-n-chips at Spud, located across the street. Bellevue’s very own version of Central Park, this urban sanctuary is centrally located in the midst of shopping, Starbucks and skyscrapers. The area is beautiful, with rolling lawns and a reflecting pond, complete with a “waterfall” that resembles an infinity pool in a ritzy resort. 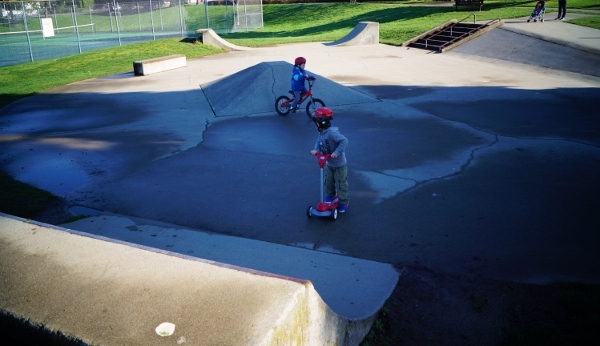 Kids can hit the pavement with their scooters, balance bikes or big wheels, following the half-mile path that loops the park. There are benches aplenty on which parents or grandparents can relax as they watch their little ones wear themselves out, and if it’s a sunny day, the park makes a perfect spot to picnic. After biking: Make a playground stop, or watch ducks (or chase, in my son’s case) at the pond. Bellevue Square is right across the street; grab a treat at Specialty's Cafe and Bakery and check out the Kids’ Cove play area on the third floor. Winner of several Golden Teddy Awards, Grass Lawn Park is in a class of its own. From the spray park and climbing rock area to the massive web-like play structure (with slides, swings and sandboxes in between), this park really has it all. The paved paths are perfect for little kiddos on wheels, with gentle turns and slopes. We scooted our way from the spray park up to the playground (where my son got in some major swing-time), then continued on to the web structure, then back around. After biking: The amenities of Redmond Town Center are a hop, skip and scoot away. After biking: Crossroads Shopping Center is nearby, so grab lunch or do a little shopping (Half Price Books is a favorite). If the kiddos get a second wind, they can get their wiggles out at WiggleWorks, a soft-play area for kids under four feet in height. When it comes to kiddos and their new-found scooting skills, skate parks can work just as well as paved trails (just make sure there aren’t any serious skateboarders around). 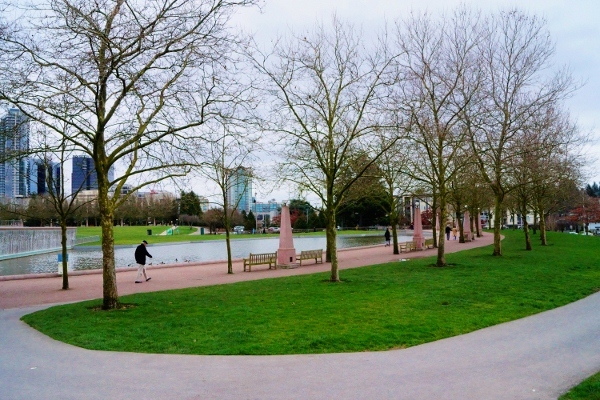 Situated between baseball diamonds and the Park Place shopping area in Kirkland, Peter Kirk Park has a new, large playground and a small skate park where kids enjoy riding on scoot bikes and scooters in addition to skateboards. 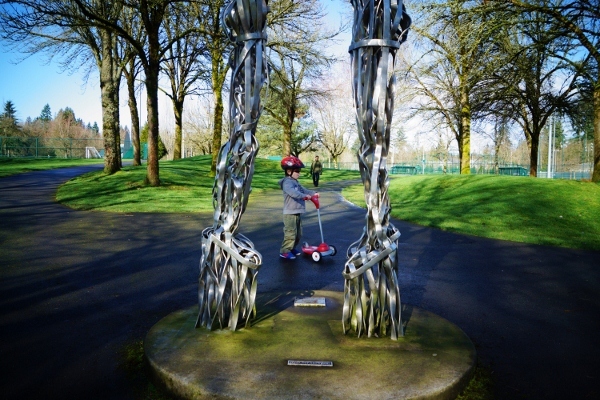 Find lots of great parks for scooting in Seattle here. Editor's note: This article was originally published in 2013 and updated for 2016.